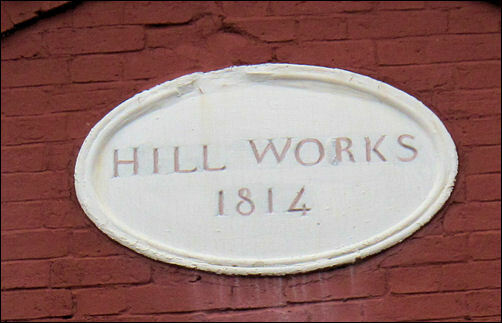 The Hill Works, re-built in 1814 by John and Richard Riley, replicating the corner plan and arched coach entrance of Enoch Wood’s Fountain Place Works, and displaying the customary Venetian façade. Considering to be "one of the best pottery offices and warehouses" remaining in the city. 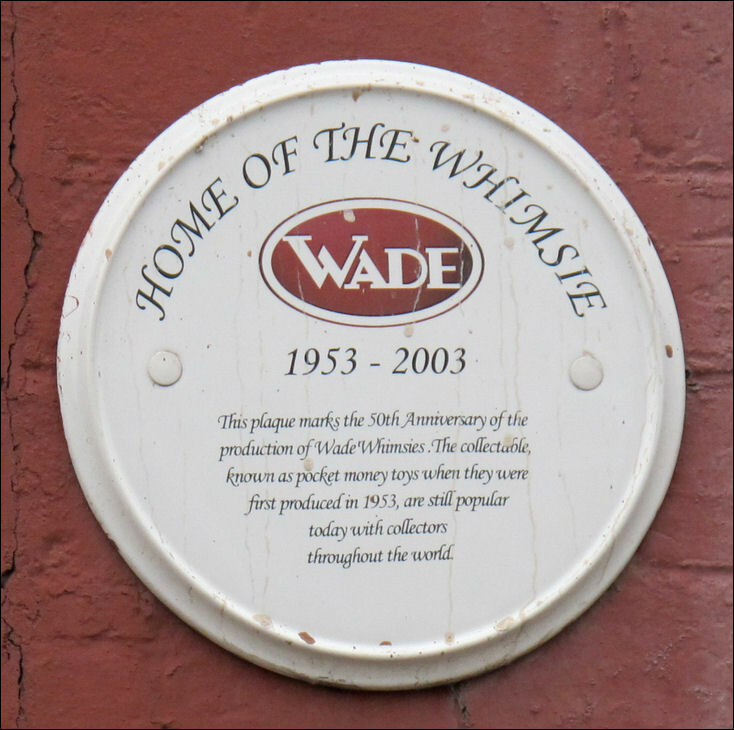 Wade Heath and Co. and then Wades Ltd. occupied the building from 1954 to 2010 when they moved to new works at the Festival Site, Etruria. 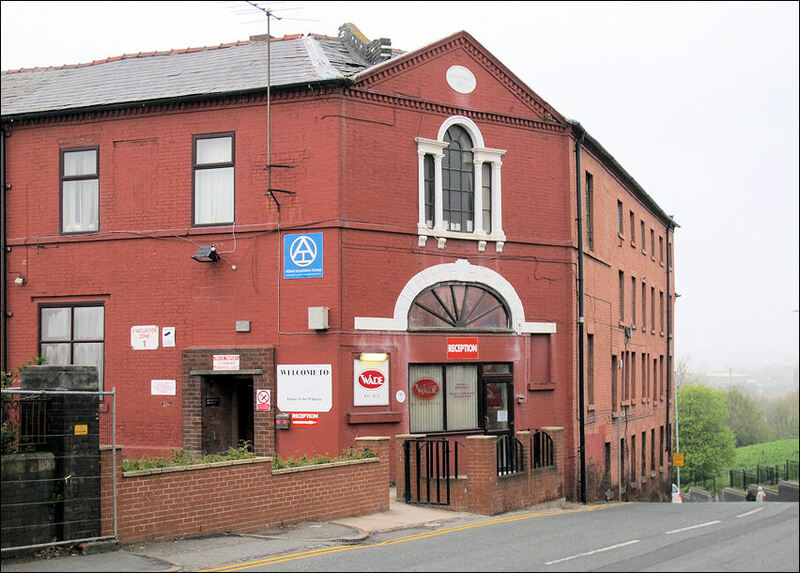 Westport Road runs from Fountain Square (end of Market Place) in Burslem town centre down to the junction of Davenport Street and Brownhills Road. Westport Road was originally Liverpool Road - it was renamed in the early 1950's. In the early early 1800's this road was indeed the road, through Tunstall and onto the North and Liverpool - where pottery ware was transported to America. This area of Burslem was known as 'The Sytch' - pottery has been made at the site of the Hill Works from before the 1800's. On the opposite side of the road to the Hill Pottery already described. 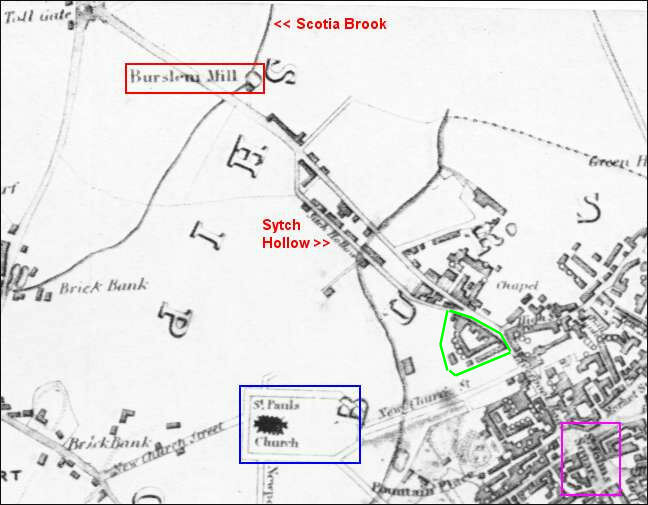 The Hill Works were of old foundation and were, I am informed, worked by Enoch Wood. 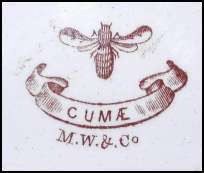 After Wood's time, the works were carried on by Mr. Taylor, and next by John and Richard Riley (who removed to them from the Nile Street Works), by whom they were rebuilt in 1814 and who produced china, earthenware and Egyptian black ware. They next passed to Alcock & Keeling and, on the retirement of the latter, to S. Alcock & Co. who, having rebuilt and enlarged the Hill Pottery, removed there as already detailed. 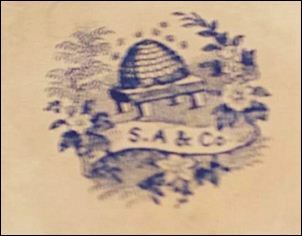 In about 1851, Barker & Son took The Hill Works for the production of goods for the home and foreign markets. 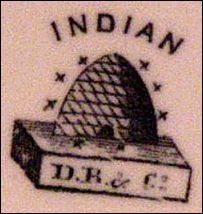 On their failure, they were, in 1860, succeeded by Morgan, Wood & Co., which firm was from 1870 to 1880 altered to Wood & Baggaley and then to Jacob Baggaley, who ceased in 1886. 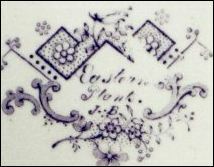 The goods, which were mostly for the home market, comprised printed and decorated dinner, toilet, tea and breakfast services, and green-glazed dessert ware. 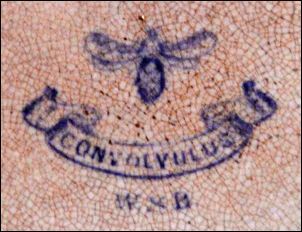 The mark used by the firm was a bee with wings expanded, beneath which is a ribbon with the initials M W & CO, or W & B, or J B. 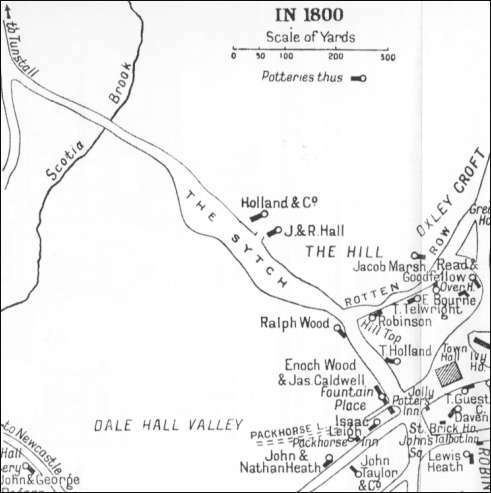 From 1886, the works were taken by Messrs. Dunn Bennett & Co."
Although Jewitt describes the 'old foundation' as being a factory of Enoch Wood - the 1800 map shown above records the works as belonging to Ralph Wood. 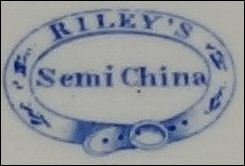 J & R Riley (who built this Hill Works in 1814) also operated from the opposite order of the road on the site of what would become the Hill Pottery. Wade Heath and Co. occupied the Hill Works from 1954 to 2009/10 when they moved to a new factory in Etruria. The Hill Works is a listed building. 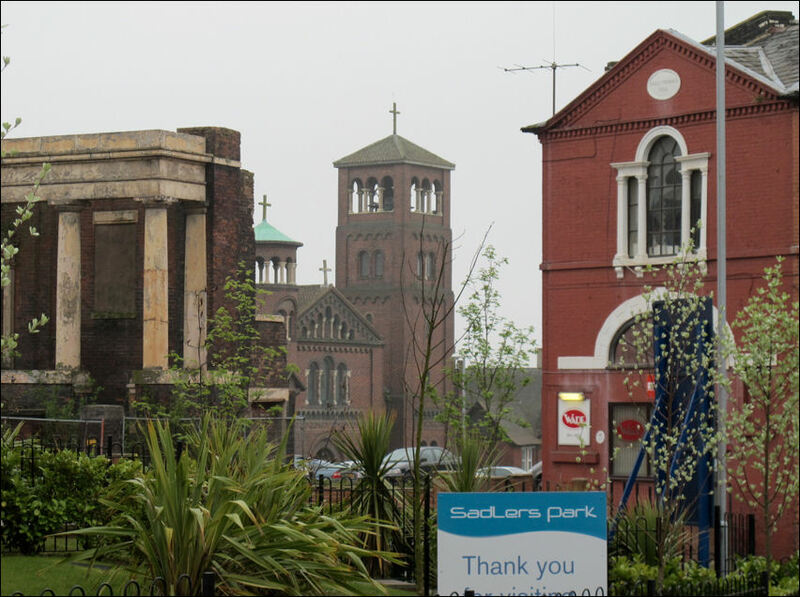 In this photo there are three listed buildings: the façade of the Hill Top Sunday School, the Roman Catholic Church of St. Joseph and the Hill Top works.